DAB+ is now being used in the UK for services directed at the listening public. DAB+ services are broadcast on the new second national commercial ensemble. In addition, there are services broadcasting on most of the small-scale trial ensembles. The BBC conducted tests of DAB+ in Scotland during 2014. Generally, however, broadcasting in the UK still uses "original-flavour" DAB transmitted in Band III. A "tick mark" has been launched as a marketing tool to signify receivers that meet a certain minimum specification. DAB+ capability is expected to be one of the requirements for the tick mark. Wohnort recommends, now more than ever, that you should consider buying a receiver that is DAB+ capable even if you never plan to take it out of the country with you. Such a receiver should also be more future-proof than one which only receives DAB. The Switchdigital DAB website has an indicative coverage map for download. Sites: Darvel, Brown Carrick Hill, Girvan and West Kilbride. The NOW Digital website has an indicative coverage map for download. Sites: Backwell, Bath, Bristol Kings Weston, Dundry East, Hutton, Milbury Heath, Pur Down, Siston. Operator: South West Digital Radio Ltd., a consortium of NOW Digital and UKRD Group Ltd. This ensemble is part of the combined franchise for Cornwall and Plymouth. Two distinct ensembles operate in the franchise area - in Plymouth on Block 12D and in Cornwall on Block 11B. Wohnort lists the two ensembles separately. Sites: Barwell water tower, Daventry, Hartshill Quarry, Ilmington, Leamington Spa, Meriden, Samuel Vale House (in central Coventry) and Shilton DAB. *1) When observed on 12.12.2018, 16.02.2019 and 25.03.2019, there appeared to be an unlabelled service attached to no components of either type. Consistent results were obtained from multiple "from scratch" scans conducted over a period of time at different locations on different days. This is the only ensemble to have produced these results. Operator: This area has not yet been timetabled for advertisement. The frequency allocated to Derbyshire lies outside the range of the seven blocks used during the initial UK DAB roll-out. Some older radios may not include Block 10B in their automatic scans. In this case, select the option "Full Scan" in the receiver's menus. This may also be called a "Rest of the World" scan, as opposed to a "UK" scan. A small number of early DAB receivers, including some Goodmans models, are unable to receive the new frequencies at all. Other Sites*1: Chesterfield and Whiteborough. *1 Mentioned in the licence application but not brought into service. Sites: Ashburton, Beacon Hill, Brixham, Budleigh Saltereton, Exeter (St. Thomas), Holcombe Down, Kingswear Dartmouth, Sidmouth, Stockland Hill and Tiverton. The NOW Digital website has a map of the original Exeter/Torbay coverage area for download. 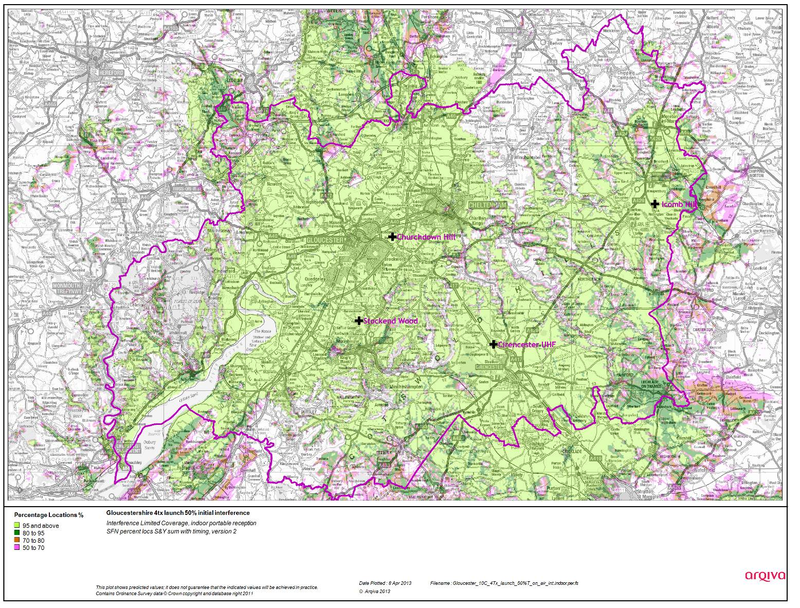 The NOW Digital website has a separate map for download showing coverage in North Devon. The frequency allocated to Gloucestershire lies outside the range of the seven blocks used during the initial UK DAB roll-out. Some older radios may not include Block 10C in their automatic scans. In this case, select the option "Full Scan" in the receiver's menus. This may also be called a "Rest of the World" scan, as opposed to a "UK" scan. 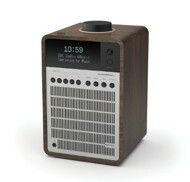 A small number of early DAB receivers, including some Goodmans models, are unable to receive the new frequencies at all. The MuxCo website has a coverage map for download. Operator: MuxCo South Midlands Ltd. The frequency allocated to Herts, Beds and Bucks lies outside the range of the seven blocks used during the initial UK DAB roll-out. Some older radios may not include Block 10D in their automatic scans. In this case, select the option "Full Scan" in the receiver's menus. This may also be called a "Rest of the World" scan, as opposed to a "UK" scan. A small number of early DAB receivers, including some Goodmans models, are unable to receive the new frequencies at all. *1) Both services point to the same audio subchannel. The new frequency allocated to Humberside lies outside the range of the seven blocks used during the initial UK DAB roll-out. Some older radios may not include Block 10D in their automatic scans. In this case, select the option "Full Scan" in the receiver's menus. This may also be called a "Rest of the World" scan, as opposed to a "UK" scan. A small number of early DAB receivers, including some Goodmans models, are unable to receive the new frequencies at all. This ensemble migrated from Block 11B to 10D on September 1st 2016. Because of international frequency restrictions it will not be possible, currently, for the ensemble to cover the coastal area of the English Channel. "Dunkirk" refers to the village in Kent between Faversham and Canterbury. Operator: Bauer Digital Radio Ltd.
*1 Services point to the same audio stream. Operator: MuxCo Lincolnshire Limited (Lincs FM Group Ltd 51%, MuxCo Ltd 49%). The MuxCo website has indoor and outdoor indicative coverage maps for download. The new frequency allocated to Liverpool lies outside the range of the seven blocks used during the initial UK DAB roll-out. Some older radios may not include Block 10C in their automatic scans. In this case, select the option "Full Scan" in the receiver's menus. This may also be called a "Rest of the World" scan, as opposed to a "UK" scan. A small number of early DAB receivers, including some Goodmans models, are unable to receive the new frequencies at all. This ensemble migrated from Block 11C to 12C overnight May 24th/25th 2016. 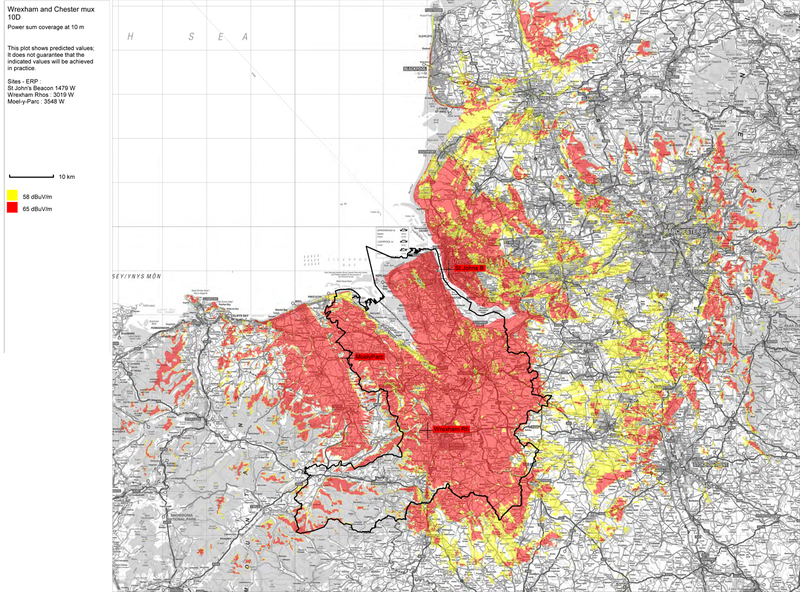 MuxCo states it has not identified a commercially viable way of serving Ceredigion and Powys (Block 10C) but will work with others during the licence term to identify ways of extending DAB into this area. *1) BBC R Cymru 2 broadcasts at certain times of the day only. The stream is flagged both as a Secondary Component of BBC Radio Cymru and as a Service in its own right. Bitrates of other BBC services drop at those times. The frequency allocated to Norfolk lies outside the range of the seven blocks used during the initial UK DAB roll-out. Some older radios may not include Block 10B in their automatic scans. In this case, select the option "Full Scan" in the receiver's menus. This may also be called a "Rest of the World" scan, as opposed to a "UK" scan. A small number of early DAB receivers, including some Goodmans models, are unable to receive the new frequencies at all. The frequency allocated to NE Wales & West Cheshire lies outside the range of the seven blocks used during the initial UK DAB roll-out. Some older radios may not include Block 10D in their automatic scans. In this case, select the option "Full Scan" in the receiver's menus. This may also be called a "Rest of the World" scan, as opposed to a "UK" scan. A small number of early DAB receivers, including some Goodmans models, are unable to receive the new frequencies at all. MuxCo has stated previously that it wished to merge its franchise for NE Wales & West Cheshire with that for North Wales. The latter has since launched as North West Wales. One of the frequencies allocated to North West Wales lies outside the range of the seven blocks used during the initial UK DAB roll-out. Some older radios may not include Block 10D in their automatic scans. In this case, select the option "Full Scan" in the receiver's menus. This may also be called a "Rest of the World" scan, as opposed to a "UK" scan. A small number of early DAB receivers, including some Goodmans models, are unable to receive the new frequencies at all. MuxCo had stated previously it was seeking to merge its franchise for Chester & Wrexham with that for North Wales. The ensemble launched as a separate multiplex, however. *1) This service broadcasts the 103.0 MHz FM version. *2) This service broadcasts the 96.3 MHz FM version. *3) This service broadcasts the 107.3 MHz FM version. *4) BBC R Cymru 2 broadcasts certain times of the day only. Other service bitrates vary. The frequency allocated to North Yorkshire lies outside the range of the seven blocks used during the initial UK DAB roll-out. Some older radios may not include Block 10C in their automatic scans. In this case, select the option "Full Scan" in the receiver's menus. This may also be called a "Rest of the World" scan, as opposed to a "UK" scan. A small number of early DAB receivers, including some Goodmans models, are unable to receive the new frequencies at all. The licence was advertised as an MFN with Block 10B being used in the west and 10C in the east. MuxCo have stated they will use Block 10C from all transmitters in their network. The frequency allocated to Northamptonshire lies outside the range of the seven blocks used during the initial UK DAB roll-out. Some older radios may not include Block 10C in their automatic scans. In this case, select the option "Full Scan" in the receiver's menus. This may also be called a "Rest of the World" scan, as opposed to a "UK" scan. A small number of early DAB receivers, including some Goodmans models, are unable to receive the new frequencies at all. The frequency allocated to Oxfordshire lies outside the range of the seven blocks used during the initial UK DAB roll-out. Some older radios may not include Block 10B in their automatic scans. In this case, select the option "Full Scan" in the receiver's menus. This may also be called a "Rest of the World" scan, as opposed to a "UK" scan. A small number of early DAB receivers, including some Goodmans models, are unable to receive the new frequencies at all. Operator: NOW Digital, (Now Digital 75%, Passion Radio (Oxford) Ltd 25%). This ensemble migrated from Block 12A in November 2015. * Trax FM carries the Doncaster version of its programme. The frequency allocated to Somerset lies outside the range of the seven blocks used during the initial UK DAB roll-out. Some older radios may not include Block 10B in their automatic scans. In this case, select the option "Full Scan" in the receiver's menus. This may also be called a "Rest of the World" scan, as opposed to a "UK" scan. A small number of early DAB receivers, including some Goodmans models, are unable to receive the new frequencies at all. The frequency allocated to Suffolk lies outside the range of the seven blocks used during the initial UK DAB roll-out. Some older radios may not include Block 10C in their automatic scans. In this case, select the option "Full Scan" in the receiver's menus. This may also be called a "Rest of the World" scan, as opposed to a "UK" scan. A small number of early DAB receivers, including some Goodmans models, are unable to receive the new frequencies at all. The MuxCo website has an indicative coverage map for download. The frequency allocated to Surrey and N. Sussex lies outside the range of the seven blocks used during the initial UK DAB roll-out. Some older radios may not include Block 10C in their automatic scans. In this case, select the option "Full Scan" in the receiver's menus. This may also be called a "Rest of the World" scan, as opposed to a "UK" scan. A small number of early DAB receivers, including some Goodmans models, are unable to receive the new frequencies at all. Operator: MuxCo Surrey and North Sussex Ltd. (UKRD Group Ltd 50%, MuxCo Ltd 50%). The frequency allocated to Sussex lies outside the range of the seven blocks used during the initial UK DAB roll-out. Some older radios may not include Block 10B in their automatic scans. In this case, select the option "Full Scan" in the receiver's menus. This may also be called a "Rest of the World" scan, as opposed to a "UK" scan. A small number of early DAB receivers, including some Goodmans models, are unable to receive the new frequencies at all. *1) BBC R Cymru 2 broadcasts at certain times of the day only. The stream is flagged both as a Secondary Component of BBC Radio Cymru and as a Service in its own right. It is transmitted at a lower Protection Level than the other BBC services, whose bitrates drop at those times. This ensemble is part of the combined franchise for Swindon and West Wilts. Two distinct ensembles operate in the franchise area - in Swindon on Block 11C (220.352 MHz) and in Bath and West Wiltshire on Block 12D (229.072MHz). Wohnort lists the two ensembles separately. A new portable DAB/DAB+ and FM radio from Sony. The XDR-S40DBP can be operated by four "AA" batteries or by an external mains power adaptor, the radio is available in three finishes - black, white or red. Sites: Angus, Purin Hill, Kirkton Mailer (Perth) and Faire Mhor (Pitlochry). Kinross was promised no later than October 2004. The frequency allocated to West Wiltshire lies outside the range of the seven blocks used during the initial UK DAB roll-out. Some older radios may not include Block 10D in their automatic scans. In this case, select the option "Full Scan" in the receiver's menus. This may also be called a "Rest of the World" scan, as opposed to a "UK" scan. A small number of early DAB receivers, including some Goodmans models, are unable to receive the new frequencies at all. This ensemble is part of the combined franchise for Swindon and West Wilts. Two distinct ensembles operate in the franchise area - in Swindon on Block 11C (220.352 MHz) and in Bath and West Wiltshire on Block 10D (215.072). Wohnort lists the two ensembles separately. This ensemble migrated from Block 12D to 10D overnight Thursday 22nd October 2015 to Friday 23rd October. The UK regulator is to develop plans for the implementation and licensing of small-scale DAB. A low-power trial was run in Brighton during the Autumn of 2012 that demonstrated the feasibility of using software-defined solutions for coding and multiplexing. Ofcom has awarded licences for further trials in 10 areas. Ofcom will report to government in mid-2016 at the conclusion of the trials and make recommendations on a licensing framework. The frequency allocated to the Aldershot trial lies outside the range of the seven blocks used during the initial UK DAB roll-out. Some older radios may not include Block 8A in their automatic scans. In this case, select the option "Full Scan" in the receiver's menus. This may also be called a "Rest of the World" scan, as opposed to a "UK" scan. A small number of early DAB receivers, including some Goodmans models, are unable to receive the new frequencies at all. 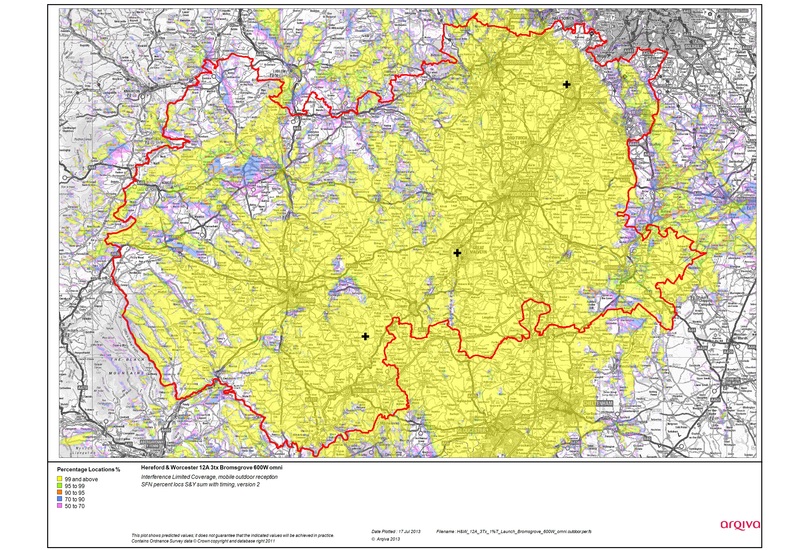 The frequency allocated to the Birmingham trial lies outside the range of the seven blocks used during the initial UK DAB roll-out. Some older radios may not include Block 9A in their automatic scans. In this case, select the option "Full Scan" in the receiver's menus. This may also be called a "Rest of the World" scan, as opposed to a "UK" scan. A small number of early DAB receivers, including some Goodmans models, are unable to receive the new frequencies at all. The frequency allocated to the Brighton trial lies outside the range of the seven blocks used during the initial UK DAB roll-out. Some older radios may not include Block 9A in their automatic scans. In this case, select the option "Full Scan" in the receiver's menus. This may also be called a "Rest of the World" scan, as opposed to a "UK" scan. A small number of early DAB receivers, including some Goodmans models, are unable to receive the new frequencies at all. The frequency allocated to the Bristol trial lies outside the range of the seven blocks used during the initial UK DAB roll-out. Some older radios may not include Block 9A in their automatic scans. In this case, select the option "Full Scan" in the receiver's menus. This may also be called a "Rest of the World" scan, as opposed to a "UK" scan. A small number of early DAB receivers, including some Goodmans models, are unable to receive the new frequencies at all. The frequency allocated to the Cambridge trial lies outside the range of the seven blocks used during the initial UK DAB roll-out. Some older radios may not include Block 7D in their automatic scans. In this case, select the option "Full Scan" in the receiver's menus. This may also be called a "Rest of the World" scan, as opposed to a "UK" scan. A small number of early DAB receivers, including some Goodmans models, are unable to receive the new frequencies at all. The frequency allocated to the Glasgow trial lies outside the range of the seven blocks used during the initial UK DAB roll-out. Some older radios may not include Block 10B in their automatic scans. In this case, select the option "Full Scan" in the receiver's menus. This may also be called a "Rest of the World" scan, as opposed to a "UK" scan. A small number of early DAB receivers, including some Goodmans models, are unable to receive the new frequencies at all. Operator: Nation Digital Investments Ltd. The frequency allocated to the London trial lies outside the range of the seven blocks used during the initial UK DAB roll-out. Some older radios may not include Block 9A in their automatic scans. In this case, select the option "Full Scan" in the receiver's menus. This may also be called a "Rest of the World" scan, as opposed to a "UK" scan. A small number of early DAB receivers, including some Goodmans models, are unable to receive the new frequencies at all. The frequency allocated to the Manchester trial lies outside the range of the seven blocks used during the initial UK DAB roll-out. Some older radios may not include Block 10B in their automatic scans. In this case, select the option "Full Scan" in the receiver's menus. This may also be called a "Rest of the World" scan, as opposed to a "UK" scan. A small number of early DAB receivers, including some Goodmans models, are unable to receive the new frequencies at all. The frequency allocated to the Norwich trial lies outside the range of the seven blocks used during the initial UK DAB roll-out. Some older radios may not include Block 9A in their automatic scans. In this case, select the option "Full Scan" in the receiver's menus. This may also be called a "Rest of the World" scan, as opposed to a "UK" scan. A small number of early DAB receivers, including some Goodmans models, are unable to receive the new frequencies at all. 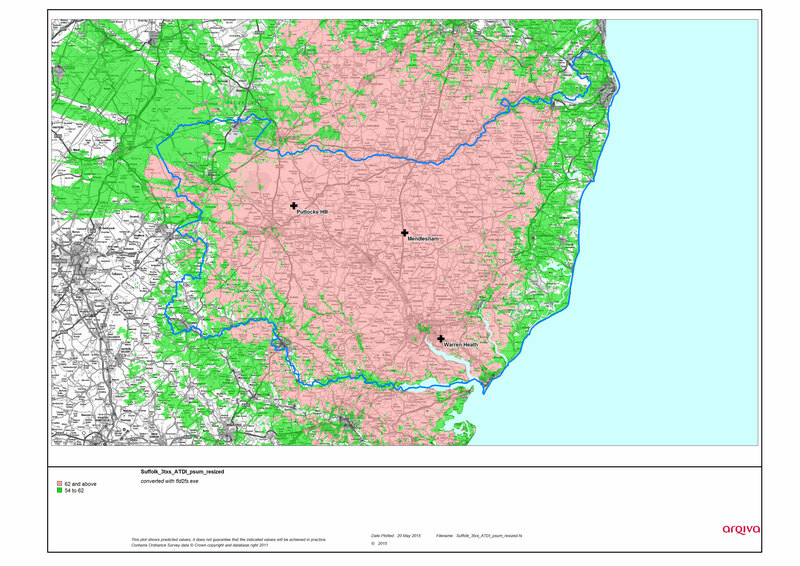 The Future Digital Norfolk website has an indicative coverage map. The frequency allocated to the Portsmouth trial lies outside the range of the seven blocks used during the initial UK DAB roll-out. Some older radios may not include Block 7D in their automatic scans. In this case, select the option "Full Scan" in the receiver's menus. This may also be called a "Rest of the World" scan, as opposed to a "UK" scan. A small number of early DAB receivers, including some Goodmans models, are unable to receive the new frequencies at all. The Solent Wireless website includes an indicative coverage map. The UK regulator occasionally grants licences for testing and development. Such tests have taken place previously in London and Cambridge. Unlike the current Small-Scale Trials, any audio content is for engineering purposes and not intended for public consumption. This test ensemble ceased in April 2016. The broadcasts consisted of changing multiplex re-configurations to assist in the development and evaluation of receivers and future services. The ensemble has not been seen recently and is assumed to have ceased. The broadcasts consisted of changing multiplex re-configurations to assist in the development and evaluation of receivers and future services. These transmissions ceased at the beginning of December 2009. This ensemble ran regularly-repeating multiplex re-configurations to assist in the development and evaluation of receivers and future services, similar to the Block LC ensemble later used by Arqiva. The DRAFFT tests have now ceased. This experimental ensemble ceased in Autumn 2002. The frequency was required for the Leicester local ensemble, scheduled to begin in November 2002. Note that despite the Service Label, the packet data service was seen to be running at 80 kbit/s. The Isle of Man is not part of the United Kingdom but a self-governing British Crown dependency. The island is not an ITU Member State and on matters of international radio spectrum regulation and co-ordination is represented by the United Kingdom. This ensemble, a trial broadcast including interactive data services designed to be used in conjunction with 3G mobile phones ceased on 13th May 2003. The licence for this transmission expired 14th May 2003.